Original Mission Statement: Creating intellectual community and a framework for the integration of Latino and Latin American Studies, launching faculty and student grantee speaker series, collaborating in campus-wide conferences, events, and symposia, funding key faculty research. Following a preliminary proposal developed by Dr. Lynn Stephen (anthropology) in January 2007, the incubation of CLLAS formally began in the fall of 2007 and a formal advisory board was formed with Carlos Aguirre (history), Cecilia Enjuto Rangel (romance languages), Pedro Garcia-Caro (education studies), Michael Hames-García (ethnic studies), Kathryn Lynch (environmental studies), Ernesto Martínez (women’s and gender studies; ethnic studies), Gabriela Martínez (SOJC), Edward Olivos (education studies), Analisa Taylor (romance languages), Tania Triana (romance languages), and Stephanie Wood (CSWS; Wired Humanities Project) as members in addition to Dr. Stephen. The founding group received generous support from the Center for the Study of Women in Society (CSWS) through providing two offices and access to their accountant, Peggy McConnell. 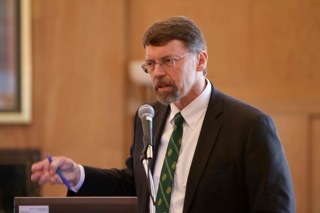 Dr. Stephen continued that year as associate director of CSWS. 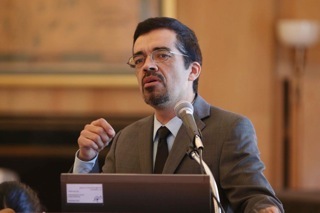 In December, the group produced an updated document outlining the vision and activities, and formalized the name as the proposed Center for Latino/a and Latin American Studies. The group formalized the faculty and graduate student grant programs and guidelines, conferences and events, strategies for fundraising and grant writing, a program of community outreach, and a plan for a website. 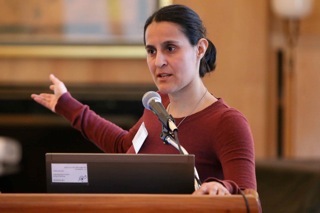 The advisory board held six meetings that year and launched both faculty and graduate student grant programs—funding faculty collaborative projects and three graduate students to do summer research. One of the faculty projects funded between the Farmworker Housing Development Corporation and two UO faculty members, Heather McClure and Josh Snodgrass, was the pilot for a later, larger project that received a $750,000 federal grant in 2013. During AY 2008-2009, the Proposed Center for Latino/a and Latin American Studies continued to consolidate and grow, expanding its advisory board by several people and working as a group to facilitate conversations that would help to develop the mission of bridging Latino/a and Latin American Studies. The advisory group developed a strong relationship with the newly hired director of CSWS, Carol Stabile. 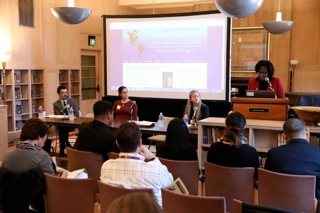 The group collaborated in a major symposium with Latin American Studies titled “From Che to Ramona to Evo: Leftist Political Cultures in Latin America, 1960s-2000s,” which brought six scholars to campus. 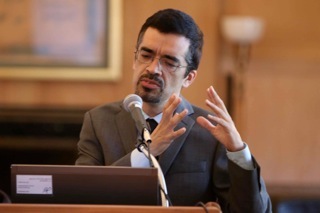 The group also organized a public lecture series titled “Putting Latino/a and Latin American Studies in Conversation,” which brought four visiting scholars to campus for public lectures, lunch-time workshops and conversations with CLLAS board members and other interested parties. Visiting scholars included: Rosaura Sánchez (Department of Literature, UCSD), Beatrice Pita (Department of Literature, UCSD), Frances Aparicio (University of Illinois, Chicago—now at Northeastern), Lourdes Portillo (independent filmmaker), and Ramona Hernandez (Center for Dominican Studies, CUNY). 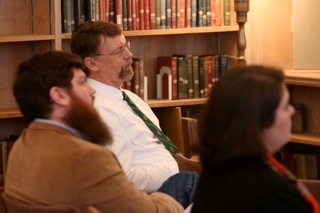 CLLAS board members and others read an article by each visiting scholar and also had a chance to talk with them about their experiences in institution building. All were scholars who bridged Latino/a and Latin American Studies in their own research and had experience leading efforts at building programs and centers. 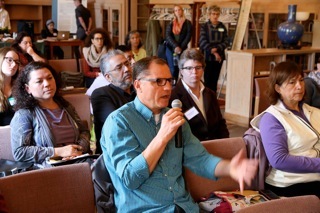 This series of conversations was important in consolidating the shared mission of CLLAS and in bringing in other colleagues at UO to work with the CLLAS advisory group. 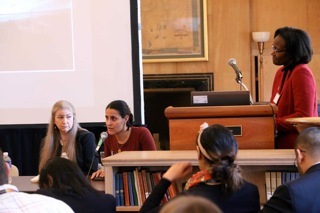 In AY 2008-2009 the group also initiated a grant recipient speaker series, in which graduate student grantees and faculty grantees give public talks about their projects. These spaces have been important in building intellectual community on campus by providing a forum for graduate students and faculty that allows them to cross disciplinary lines and learn about each other’s research. CLLAS funded one graduate student project and two faculty projects during that year. 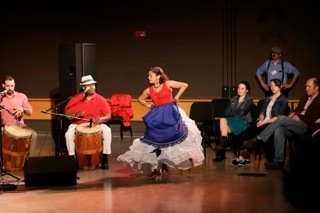 One faculty project was a film that is now part of the larger Latino Roots project of CLLAS and the other, “Being Latino at UO: A Survey,” was the first survey of Latino students at UO and resulted in the creation of a new undergraduate program—the Spanish Heritage Language Program. This is designed for students who, for diverse reasons, grew up speaking Spanish at home or in other spaces outside a formal classroom setting and who want to develop their linguistic abilities. A new faculty line was secured for this program, in part due to data collected through this survey. It still stands as the best and most comprehensive source of information on Latino students at UO. In January 2009, Alice Evans, the research dissemination specialist hired by CSWS, began to work with CLLAS. 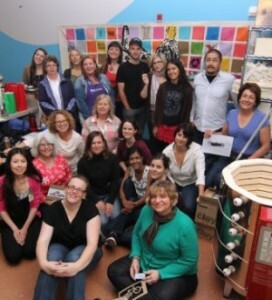 CSWS continued to support CLLAS with staff and space. 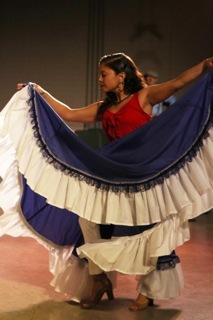 In January 2009, the Latino Roots Project was inaugurated through an exhibit at the Lane County Historical Museum. It included 16 panels, eight videos, and a bilingual booklet that became the core of the now much-expanded project. It was on display for more than a year at the Lane County Historical Museum and thousands of people viewed it, including many children from local schools and other programs. It left the museum in March 2010 and began to circulate in other parts of the state after that time. CLLAS collaborated in a series of intellectual activities the group organized. CLLAS leadership in the America’s Big Idea also allowed CLLAS to offer greater support to assistant director, Eli Meyer (hired as interim assistant director in September 2010 and as assistant director in September 2011),who is now full time. 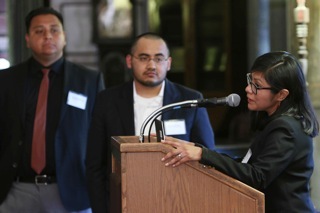 For the duration of the America’s project, the staff of CLLAS and its director were key players and the motor for the effort in collaboration with Carlos Aguirre (LAS director), Michael Hames-García (CRESS director and Ethnic Studies head) and Janne Underriner (Director of the Northwest Indian Language Institute). In the fall and winter of 2009, CLLAS board members worked closely with Dr. Stephen to craft a three-year Memorandum of Understanding (MOU) that would be the blueprint for the funding, staffing, and activities of CLLAS for three years (AY2010-2011, AY 2011-2012, AY 2012-2013). 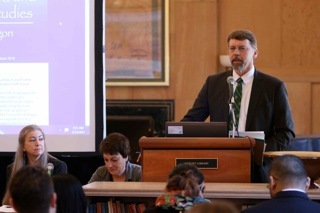 The process of obtaining support for CLLAS as an independent research center involved a series of conversations and negotiations with then vice presidents for research and graduate education (Rich Linton, Sandy Morgen) and CAS deans (Scott Coltrane, Larry Singell, Judith Baskin). In January 2010, the MOU formalizing CLLAS as an independent research center with three years of funding was signed, culminating a three-year process of organizing and incubation. The original MOU designated Lynn Stephen as director for a three-year term. The 2010 MOU outlined the structure, space, staffing, appointment procedures for key personnel and advisory board, reporting structure, links to UO faculty and other groups, goals, budget, fundraising plan and a review plan. In AY 2009-2010, CLLAS continued its public speaker series and discussion series on “Putting Latino/a and Latin American Studies in Conversation” in collaboration with Latin American Studies and other departments including Women’s and Gender Studies, Ethnic Studies, English, Philosophy, and Romance Languages as well as the College of Arts and Sciences (which funded a grant for the series). CLLAS hosted five speakers: Robert Irwin (Spanish and Portuguese, UC Davis), Ana Alonso (anthropology, University of Arizona), Pedro Di Pietro (philosophy, SUNY Binghampton), Maria Lugones (philosphy, SUNY Binghampton), Juan Carlos Padilla (independent Puerto Rican filmmaker), and Ginetta Candelario (sociology, Latino studies, Smith College). 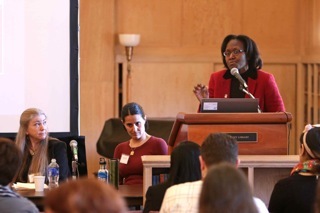 CLLAS also continued it grantee speaker series with graduate student and faculty grant recipients. CLLAS published its first newsletter in the winter of 2010 and a second in the spring of 2010. Since then we have published two newsletters per year. On Saturday, April 24, 2010, CLLAS was formally launched at a family-friendly event at the Jordan Schnitzer Museum of Art with CLLAS board members, community activists, students, and other supporters. 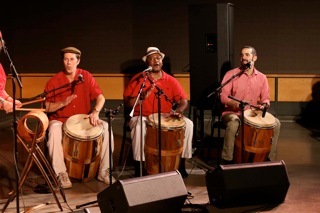 In spring 2010, three CLLAS board members launched new classes that centered Latino history, society, and social issues through grants from the Ted and Carol Williams Fund for Undergraduate Education. 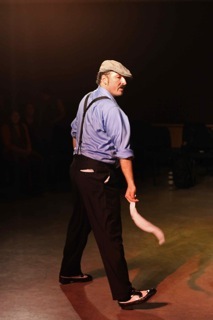 These included “From the Mexican Border to Oregon: Immigration, Education, and Citizenship” taught by Edward Olivos. Lynn Stephen and Gabriela Martínez received a grant for Latino Roots I and II, courses that became the motor of the Latino Roots project in that they trained students to do research and interviews and to produce short documentaries about Latino history in Oregon. These classes are taught every two years and the students have now produced more than 50 documentary films. 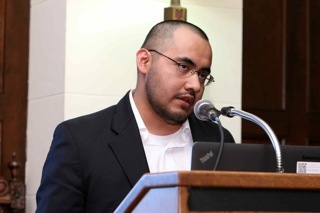 In spring 2010, CLLAS announced a record five graduate student grants (due in part to funds rolled over from the prior year) and two faculty collaborative grants, including one to Gerardo Sandoval, who applied for and received a CLLAS grant before he started working at UO in fall 2010. In AY 2010-2011 CLLAS moved forward in a number of significant collaborations and partnerships in addition to continuing its grant program, public events program, and participation in a range of other campus initiatives. 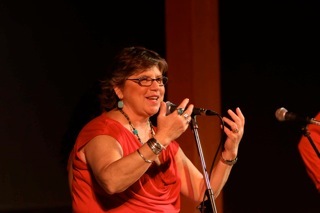 Lynn Stephen continued as co-coordinator of the Americas Big Idea in addition to being director of CLLAS. In the fall of 2010, UO Libraries Special Collections and University Archives announced an agreement with Pineros y Campesinos Unidos del Noroeste (PCUN), Oregon’s farmworker union, that they would curate the PCUN papers. As the largest and longest-standing Latino organization in the state, this partnership provided an important step in securing the historic papers of this Latino organization and building the university’s archives in Latino history. CLLAS was the mediating partner in this arrangement. 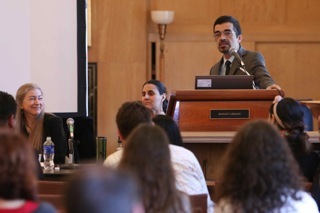 CLLAS also led discussions to initiate an exchange and collaboration agreement between the University of Oregon and the National Autonomous University of Mexico (UNAM), which came to fruition in 2012 and permits UO students to study at the UNAM in Mexico City and for UNAM students to come to UO. 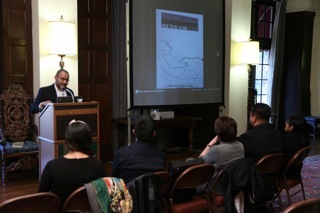 In collaboration with the Latin American Studies Program, the Americas Big Idea, and other units, CLLAS participated in a year-long cycle of events focused on “African Diasporas in the Americas.” These events included a fall symposium on “New Approaches to the Study of Slavery and Abolition in the Americas,” which brought scholars Jane Landers (Vanderbilt University), Alejandro de la Fuente (University of Pittsburgh), and Nicole con Germeten (Oregon State) to campus. In the winter term a second symposium, “Hemispheric Blackness: Rethinking the Black Diasporas,” brought Priya Kandaswamy (Mills College) and Denise Ferreira da Silva (UCSD) to campus. Visits from Haitian novelist Myriam Chancy and Juan Flores (New York University) rounded out the focus on African Diasporas. 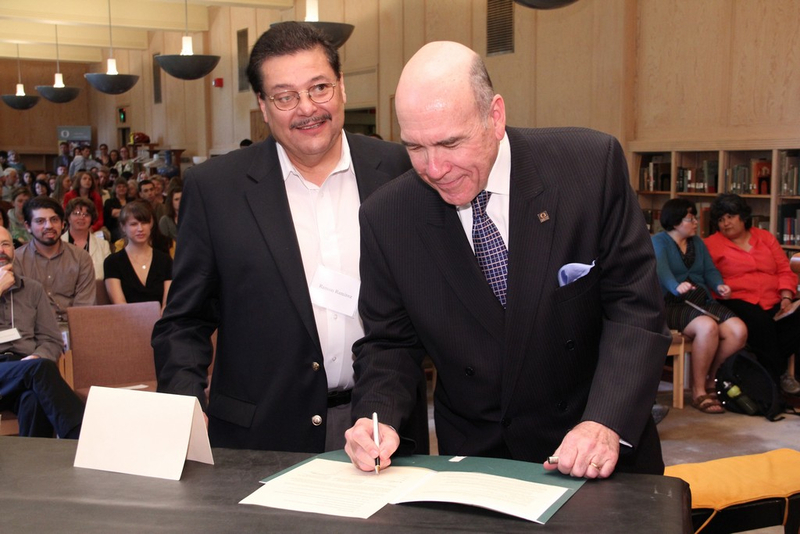 June 6, 2011—UO President Richard Lariviere (right) and PCUN President Ramón Ramírez sign documents marking the transfer of historic papers of Pineros y Campesinos Unidos del Noroeste to the UO Libraries’ Special Collections and University Archives / photograph by Jack Liu. 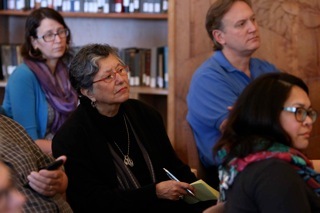 CLLAS’s advisory board grew to 20 people in the fall of 2011 and included UO staff, graduate students, and community organization participants from Eugene, Portland, and Woodburn. 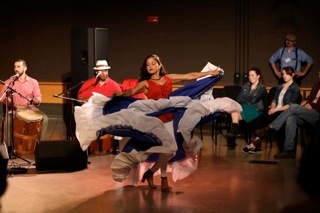 The Latino Roots classes and the PCUN partnership with UO were celebrated in a large event at Knight Library with hundreds of people in attendance coming from as far away as Portland, Salem, and Woodburn. Then UO-President Richard Lariviere signed a document marking the historic transfer of the PCUN papers to UO. Student research and videos were also celebrated. 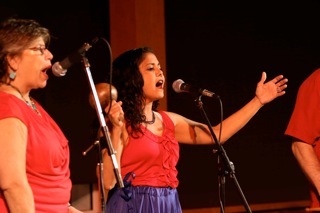 The organizing that led up to this event involved a range of campus units as well as PCUN. 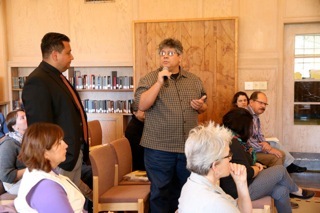 Out of this partnership a broader coalition was born called the Oregon Latino Heritage Collaborative (OLHC). 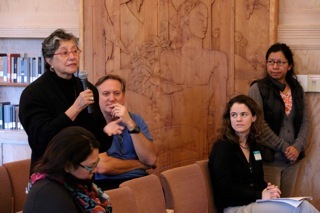 Core members of the Oregon Latino Heritage Collaborative include the Center for Latino/a and Latin American Studies, UO Libraries, UO School of Journalism and Communication, Pineros y Campesinos Unidos del Noroeste (PCUN) and CAPACES Leadership Institute, Oregon Folklife Network, UO College of Arts and Sciences, Labor Education and Research Center, UO College of Education, UO Division of Undergraduate Studies, and Amigos Multicultural Services Center. 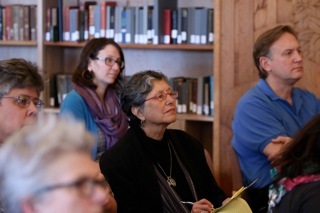 OLHC is dedicated to building the archive of Latino History at the UO and throughout the state by making historical resources available, collaborating with other institutions and groups to help them also document Latino history and build their own archives. OLHC continues at UO, run through UO Libraries Special Collections and University Archives. Finally, CLLAS gave grants to two faculty collaborative projects and three graduate student summer research projects at the end of 2011. 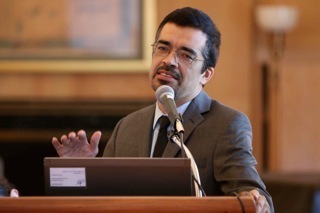 David Vásquez was named as the interim director of CLLAS for AY 2011-2012, which was the second year of the CLLAS MOU. 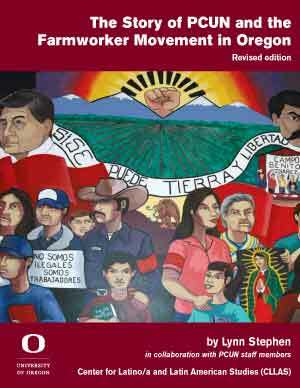 Lynn Stephen was on sabbatical at the Center for U.S.-Mexican Studies at the University of California, San Diego. Information about CLLAS activities for that year is available through CLLAS newsletters and website. 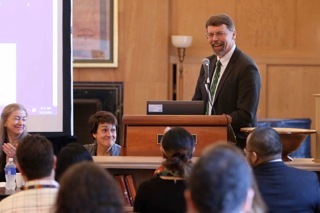 The arrival of a new UO vice president for research resulted in a complete transformation of the funding model for centers such as CLLAS with no endowment. Thanks to the work of David Vásquez and others, including long-distance phone calls and organizing from Lynn Stephen, the CLLAS MOU was honored and the funding left intact through AY 2012-2013, but with no funds coming after June 2013 except for a small stipend for the director. 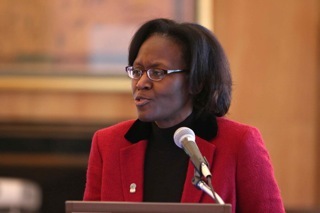 Lynn Stephen returned from a productive sabbatical to resume the directorship of CLLAS. Even before her sabbatical ended in August 2012, she began to fundraise for CLLAS along with others on the board and on campus. It was a volatile atmosphere, with a new president and many changes in the air. Many hours were spent during AY 2012-2013 in numerous meetings and conversations with the UO president, provost, deans, and other actors trying to secure funding for CLLAS into the future. Many other people participated in these endeavors, including Carlos Aguirre, Gabriela Martínez, other board members, the members of the OLHC, and community supporters. 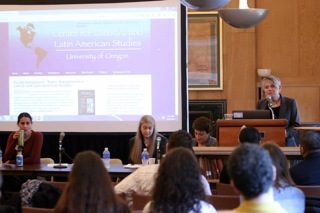 A heartening piece of news came in the fall of 2012, as CLLAS received notification that the U.S. Department of Education had selected its grant proposal, “Enhancing Latin American Studies at the University of Oregon,” which CLLAS co-authored with Latin American Studies. This proposal included strong participation by Lynn Stephen, Carlos Aguirre, Amalia Gladhart, Lori O’Hallerin, and Feather Crawford. The $186,000 grant was part of a larger fund of 1.5 million awarded to only 17 institutions across the country. 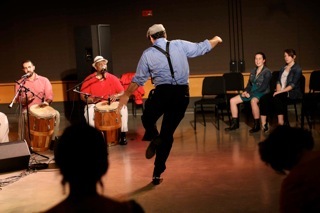 The grant supported initiatives to expand UO Latin American Studies curriculum, a student-driven project to create an online Zapotec dictionary, a summer institute for 16 middle and high school students, lectures, film series, and other initiatives to connect UO to the wider Eugene and Oregon communities. Lynn Stephen served as co-director of the grant project with Carlos Aguirre from AY 2012-2013 through AY 2014-15 and was Co-PI on the grant. 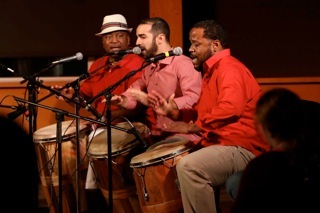 In AY 2011-12, under the leadership of interim director David Vázquez, CLLAS board member Gerardo Sandoval, and assistant director Eli Meyer CLLAS launched a two-year pilot Intercultural Competency Program (ICP) for UO graduate students. ICC combined intercultural competency training with professional development and was designed to address the increasing need for diversity in the workplace. Students who participated in the program completed three components: PPPM 552, Public Participation in Diverse Communities; a zero-week summer course focused on race, ethnicity, and culture in the workplace; and an internship focused on working in an intercultural environment. Scholarships to supplement internships were also available for participating students. The goal of the program was to help graduate students build skills in these areas in a way that their focused disciplines may not. CLLAS and ICP developed important linkages with businesses, organizations, and government agencies throughout the state of Oregon. In AY 2012-2013, ICP trained its first cohort of students and placed them in internships. The program continued in AY 2013-2014. 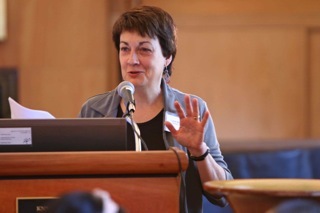 In AY 2012-2013, Lynn Stephen and others worked to secure continued funding for three to five years with a first commitment from the university of base-budget funding, to be built upon until CLLAS is at the level of support needed to staff CLLAS. With support from Dennis Galvan (vice provost for International Affairs), Yvette Alex-Assensoh, (VP for Equity and Inclusion), Barbara Altmann (then-vice provost for Academic Affairs), Scott Coltrane (then-dean of the College of Arts and Sciences), and Jim Bean (then provost) CLLAS was able to put together a full budget for AY 2014-2015 and a solid base of several years. CLLAS leadership also signed a new five-year MOU, which outlined the continued structure and governance of CLLAS. Summer Institute for teachers / photo by Jack Liu. 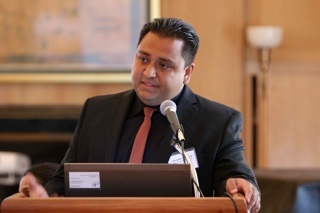 CLLAS also continued with its other activities including supporting five graduate students in their summer research and two faculty-collaborative projects. 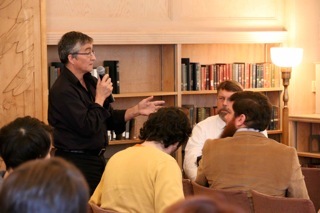 The graduate grant and faculty grant speaker series were run through winter and spring quarter. In her capacity as Co-PI of the U.S. Department of Education Project, Lynn Stephen put in much time during 2012-13 organizing a summer institute for 16 Oregon middle and high school students titled, “Understanding the Many Faces of Latin America through Art and History: Race, Ethnicity, and Nationalism.” A ten-person team met throughout the year to prepare for the summer institute. Five faculty members provided lectures for the teachers, and a visiting artist worked with the teachers in the afternoon in workshops based at JSMA. 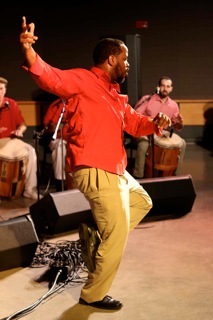 Workshops also included dance and music. The institute was a big success. AY 2012-2013 was also marked by discussions on the advisory board about changing the staffing and leadership structure to include an associate director for CLLAS. Lynn Stephen felt that it was crucial to begin training a new cohort of leaders to take CLLAS into the future. As a result of this process, two strong candidates emerged and were elected by the advisory board by consensus vote to begin in the fall of 2013 as associate directors. They were Lise Nelson, associate professor in the Department of Geography, and Gerardo Sandoval, assistant professor in the Department of Planning, Public Policy & Management. 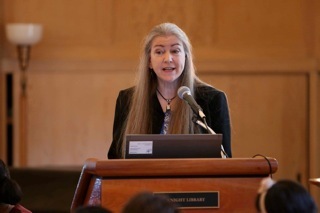 Unfortunately, Lise Nelson took a job at Penn State, so she was not able to fill the position. 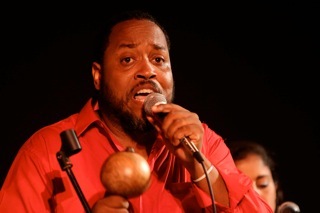 Gerardo Sandoval enthusiastically assumed the position of associate director. The board approved Lynn Stephen for a new three-year term as director, beginning AY 2013-2014. With Lynn Stephen as director and Gerardo Sandoval as associate director, CLLAS kicked off the academic year 2013-2014 with a retreat and planning process. 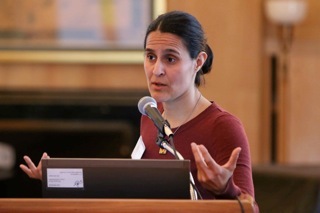 This was a fruitful exercise and led to the repackaging of CLLAS to include four Research Action Projects (RAPS): Afro-Descendent and Indigenous Peoples in the Americas; Advancing Latino Equity in Oregon; Human Rights and Social Memory; and Latino History. The board and leadership team also outlined a series of professional development activities for CLLAS-affiliated faculty and students. The CLLAS advisory board had grown to 27 members. 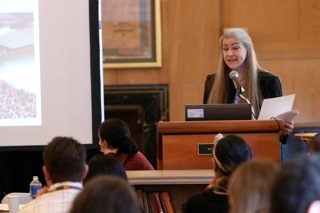 Lynn Stephen coordinated a Transnational Americas speaker series funded by the U.S. Dept. 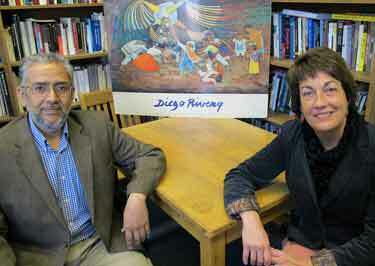 of Education grant, which looked at processes of migration in the Americas. 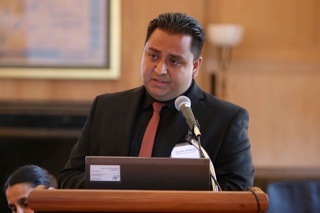 CLLAS initiated a fund-raising committee and new fund-raising efforts and partnerships. 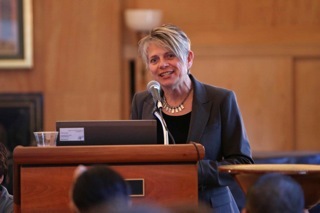 Lynn Stephen also attended a director’s meeting of funded projects by the U.S. Department of Education in Washington D.C. for several days, where she met other center and project directors. 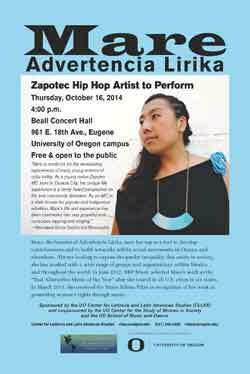 CLLAS got off to a great start this academic year by hosting a concert in mid-October with Zapotec hip hop artist Mare Advertencia Lirika. 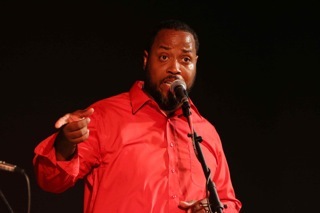 Mare gave an outstanding performance to an audience of about 325 people. 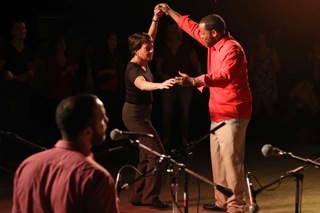 It was the first hip hop event ever in Beall Hall, and staff and faculty from UO School of Music and Dance were delightful to work with. 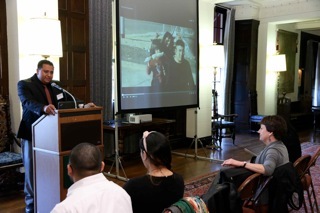 Hip hop proved to be a recurring theme of the fall season, as graduate grantee Charlie Hankin gave a presentation the following week about his CLLAS-funded research on hip hop artists in Cuba. CLLAS is strongly committed to supporting research and events in the arts as well as in the humanities and social sciences. Ana-Maurine Lara, a recent Ph.D. from Yale, kicked off her time with us by delivering a standing-room only talk titled “Santa! 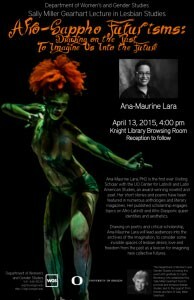 Afro-Diasporic Ways of Being and Knowing,” sponsored with the Department of Anthropology. 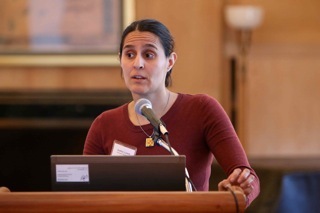 As CLLAS’s first scholar-in-residence, Dr. Lara spoke to classes, conducted a workshop for graduate students, and gave two other public talks. 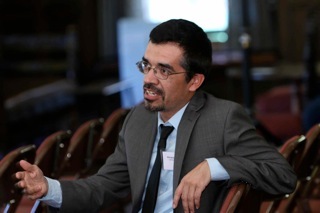 Faculty research funded by CLLAS this academic year focused on educational experiences of Latino students at UO, at the high school level, and in dual language programs. 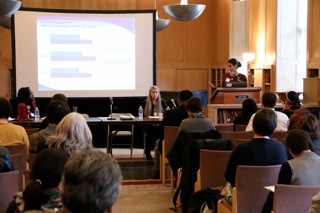 Upcoming graduates of Oregon’s public high schools are almost 25 percent Latino, and CLLAS researchers are producing important insights into the challenges these students face as well as their contributions to all levels of learning. 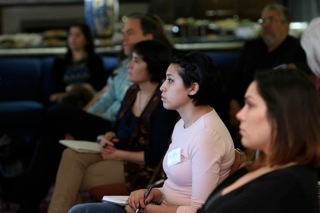 CLLAS also launched the Latino Civic Participation Project (LCPP) in an effort to empower Latinos in Oregon and encourage innovative methods of public participation. 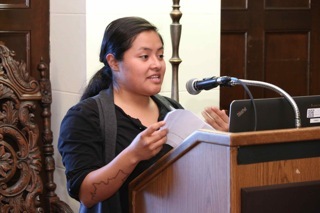 LCPP, a collaboration between UO students, CLLAS, and Oregon communities, is a novel type of needs assessment and community empowerment strategy and literally a “hands on” participatory research tool that enables Latino community members to directly articulate their local knowledge about community issues and propose solutions. 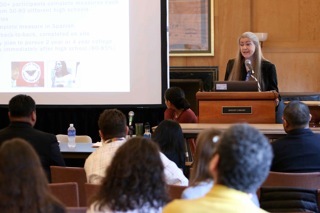 CLLAS celebrated the beginning of spring with its first ever research symposium on March 12, 2015. Titled “Public Engagement in Latin@ and Latin American Studies,” the all-day and evening event featured keynote addresses by young Dream Act activists Lizbeth Mateo and Marco Saavedra, four panels representing the four CLLAS Research Action Projects, a reception, and a dance and music performance by Puerto Rican Bomba & Proyecto Union. 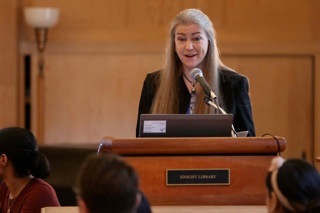 Between 200 and 300 people attended the day’s series of events, which moved across campus between the Knight Library Browsing Room, the Gerlinger Hall Alumni Lounge, and the Frohnmayer Music Building. In attendance were teachers from Salem and Woodburn, a principal from Eugene School District 4J, community representatives from the Eugene/ Springfield area, several of the people interviewed in the original Latino Roots class, community activists and leaders, and many UO students, faculty, and administrators. Some people came for the music, some for the panel discussions, others for the lively and intense keynote talks, and some attended the full day of activities, but everyone enjoyed this high-powered engagement. 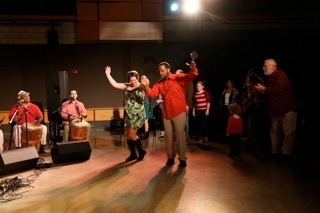 We finished the day dancing together to wonderful music. Cosponsors included the College of Arts and Sciences; School of Architecture and Allied Arts; the Latin American Studies Program; the Departments of Anthropology, History, and Romance Languages; School of Music and Dance; School of Journalism and Communication; Counseling Psychology; Division of Equity and Inclusion; Academic Affairs; and UO Libraries. This event was also supported with funding from a Department of Education UISFL grant for Latin American Studies awarded to CLLAS and the Latin American Studies Program. The CLLAS Research Action Projects (RAPS) consolidated and generated numerous successful activities. 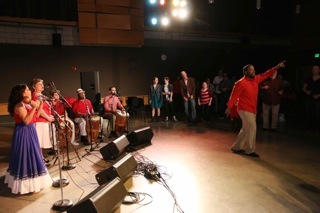 The Afro-Descendent and Indigenous Peoples RAP worked with “Reconoci.do: Dominicans of Haitian Descent,” a youth group in the Dominican Republic to bring a photographic exhibit to the Jordan Schnitzer Museum or Art and held a public discussion on Dominicans of Haitian descent. 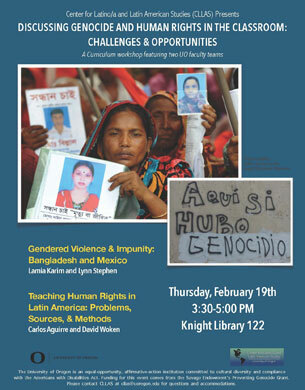 The Human Rights and Social Memory RAP presented two curriculum workshops on genocide prevention and human rights for UO faculty, an all-day workshop for public school teachers, and led a global seminar for ten UO students in Guatemala in June and July 2015 focused on human rights. The Latino History RAP continued to coordinate the Latino Roots traveling exhibit which visited eight new venues this year and was seen by 10,000 more people, bringing the total to over 30,000 views of the exhibit in Oregon. 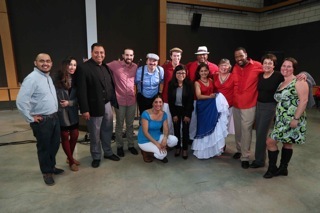 The RAP was deeply involved in the June 4th celebration of the third class of Latino Roots students who produced 16 new documentaries and donated new materials to UO Libraries Special Collections and University Archives to build the collection in Latino history. 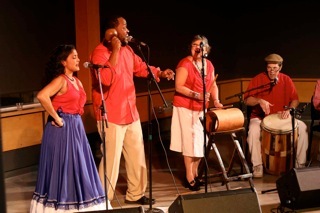 CLLAS obtained funding to hire a part-time Latino Roots coordinator for AY 2015-2016. 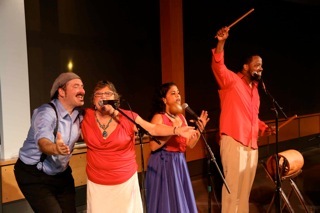 The Latino Equity RAP largely concentrated its energy on the Latino Civic Participation Project (LCPP). 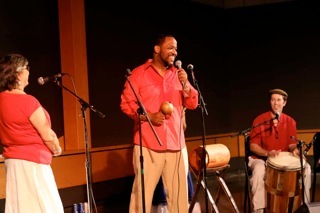 Most recently the LCPP project has completed a series of workshops with consultant James Rojas in the cities of Eugene and Springfield focused on creating more inclusive parks for the Latino community, culminating with the Latino Festival with Huerto de la Familia. The project has reached hundreds of Latino families throughout Oregon and has generated many ideas for city governments and staff. 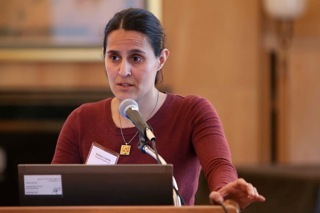 This year saw another first in CLLAS’s first visiting scholar, Dr. Ana-Maurine Lara. Her research focuses on GLBT political activism and Catholic coloniality in the Dominican Republic. She is an award-winning novelist and poet. 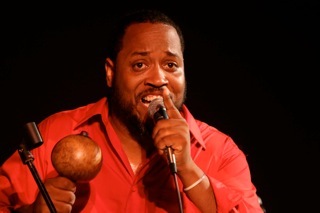 Dr. Lara gave almost a half-dozen talks on campus and was an active member of the Afro-Descendent and Indigenous Peoples RAP. 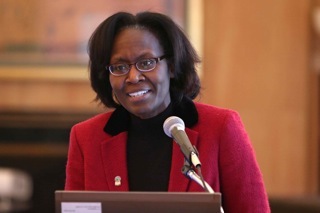 She actively mentored UO undergraduate students and participated in a wide range of events on and off campus. She accepted a tenure-track position in the Department of Anthropology at the University of Oregon beginning fall 2015. Next year, CLLAS will host its second visiting scholar with the title of post-doctoral scholar with instructional responsibilities. She is Anabel Lopez Salinas who will be finishing her dissertation in Portland State’s Public Policy program in the fall of 2015. She will be in residency at CLLAS from January–June 2016. 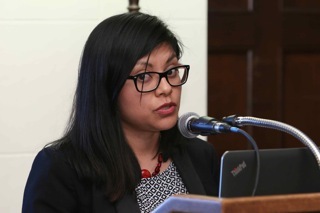 Her research is on the transnational public participation of Latinas in Oregon. 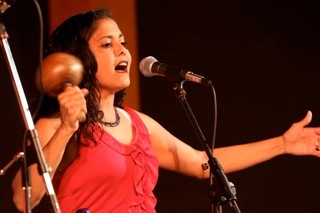 Anabel will be teaching two courses in the PPPM program and one course in the Latin American Studies program. She will also be an active participant and coordinator of the Latino Civic Participation Project. 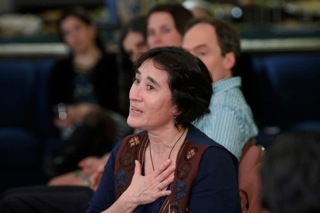 CLLAS is grateful to Latin American Studies and to the PPPM program for their support of her in the coming year. CLLAS is working with partners inside the UO to build permanent funding for this program. Next year holds many exciting activities for CLLAS. On October 15, CLLAS will kick off the fall with an exciting event on Latina/os and Education featuring Dr. Patricia Gándara, UCLA Graduate School of Education and co-director, the Civil Rights Project at UCLA, and Dr. Gustavo Balderas, incoming superintendent, Eugene School District 4J. Gerardo Sandoval and Lynn Stephen will serve as co-directors as Dr. Stephen enters her last year as a director, stepping down in June of 2016. It will be an exciting year and one of transition as CLLAS brings in new leadership and continues with its mission of research and community engagement. 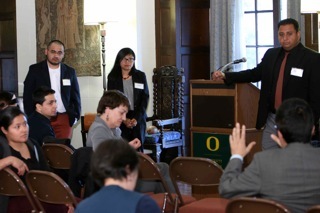 CLLAS puts the study of Latino/a and Latin American communities in conversation with one another and with the state of Oregon. A knowledge center dedicated to public access and excellence through the integration of teaching, research, community engagement and dissemination, CLLAS is an integral part of the UO’s strategy to recruit, retain, and build alumnae relations with a diverse and energized group of students, faculty, staff, parents, and families and to connect the university locally, nationally, and globally. 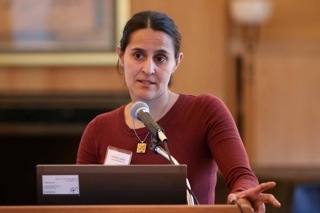 CLLAS facilitates collaborative research, scholarship, intellectual community, and community outreach focused on Latin America and U.S. Latino/a populations.